I typically give 5 stars if I would purchase the item again. This product arrived in perfect condition, seems to be very good quality and matches the description provided. Perfect for the black and white boys bathroom I designed! Chesapeake Portland Houndstooth 2pc. Black Accent Rug Set (21"x34") - 21"x34"
This beautifully hand-woven Portland accent rug in black and natural will complement any room in your home. The contrasting neutral tones of this accent rug set will not clash with your current color scheme. 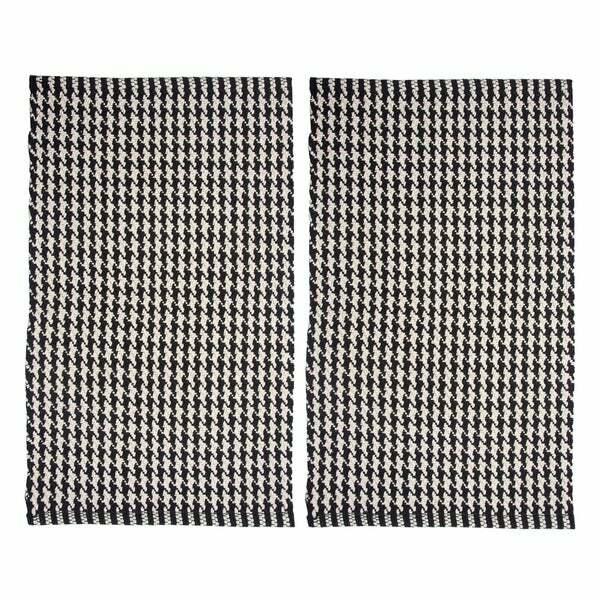 This casual 2-pc set features a simple houndstooth design in black and natural that will enhance your décor. This design is crafted from all cotton for a soft feel underfoot. The twin set would be great to add an extra touch of cozy comfort into your space. The color scheme of this neutral rug can bring the beauty of this houndstooth pattern and color contrast to your decor. A coordinating runner is also available to complete the look. Best paired with a non-slip rug pad (not included). Dimensions 34.0 In. X 21.0 In. X 0.5 In. I have been looking for an authentic houndstooth pattern and found it. These rugs look great on my kitchen floor. Great look! I just love these rugs. They are cotton and very comfortable to stand on. I used one in my bathroom and one in my kitchen. They look very farmhouse. I would definitely buy them again. You won't go wrong. These are great, and even though it says not to wash them I do. They shrink but hold up great! I am all of a sudden sick and tired of blue, which I have been very comfortable with for years. And, I guess my inspiration for liking black and white can be credited to the company Mckenzie Childs, which makes whimsical and lovely pieces.